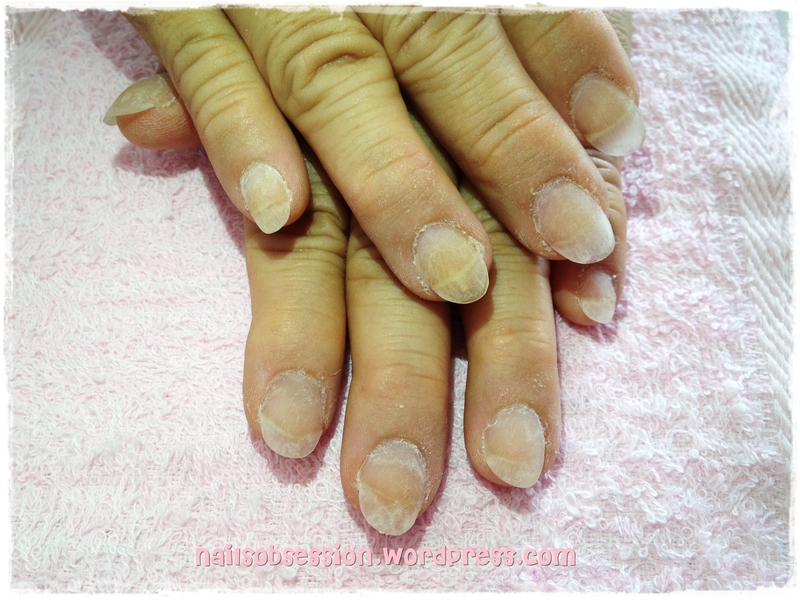 First up, a picture of momsy’s naked “before” nails. Her nail bed was quite different from what I did for my fellow friends and customer, it was short, big and her nails tend to grow upwards if the free edge exceeds 0.2mm. I had a rough time fitting the nail form due to the shape of her nails! The shape of the nail form is important becos’ it will directly affect the end result of the extension if it wasn’t done properly. Tried the usual way of cutting a round shape and it didn’t work (cutting of form is not compulsory but we cut it so that it will be customized based on customer’s nail shape), so I tried cutting it square. My first time cutting the form into a square shape omg hahahaha. I seriously think that I spent like 30 minutes or more trying to fit the form. And still it wasn’t fit properly due to my imperfect skills and a super difficult pair of nails. And so, 1 hour later.. Filed the nails oval as this is the first time momsy had such long nails, afraid that she will hurt herself if I do them square-ish. (I have customers complaining that they tend to poke/hurt themselves with square nails lol) Ta-dah! The end result! Base colour done with Angel Pro Gelly no 23. Super love this colour! I’m a fan of hot pink/pastel colours! ♥ Design adapted from Nail Max feb series (sigh hasn’t got time to purchase the latest version). Added 3 embossed ribbons on her ring fingernail and the rest of the nails are done with half-moon, with marbling art on the bottom half and 1 embossed ribbon at the top. Finally added a streak of gold glitter in the middle and complete with gel top coat for shine! Cute right? I chose the design hahahahahaha. 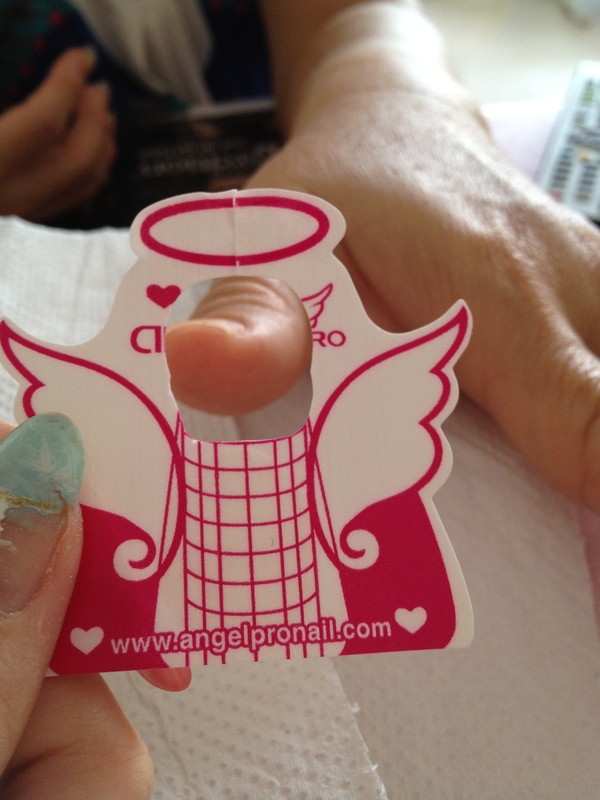 I personally feel that this design works best on long nail beds. If you realized, I’ve actually added quite a long extension for her but it still look quite stout as her initial nail bed was awfully short! ): Also did a pinky pedi to match her fingernails! Nail art inspired by my classmate Joleen’s art here! Thought that doing full set of lace and polka dot would look too messy as momsy’s toenails were super short too, so I had lace stickers on alternate nails and polka dot on the rest! Base colour done with AnGel Pro Gelly no 6 and 21. Yea I bought quite a lot gel pastel pink colours lol.. Ok, I shall cut down on buying pink and start buying other colours. Hi strawberry lace. Cute right! Putting what we learnt into use last week. Lol!